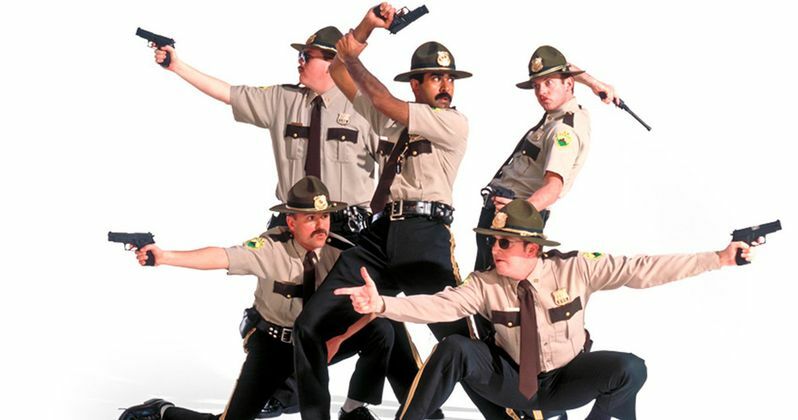 Broken Lizard officially announced that they have started working on the third Super Troopers installment, which is officially titled Super Troopers 3: Winter Soldiers. The comedic troupe had joked about a third film while they were out promoting the recently released sequel and laughed about the possibility of calling it Winter Soldiers. However, the team announced at San Diego Comic-Con over the weekend that the title is sticking at that they're currently writing it right meow. Broken Lizard took over Comic-Con for the Super Troopers 2 panel, which was basically just celebrating the success of the crowdfunded sequel. The also took time to talk about their "cinematic universe" and how everything will be tied together with Super Troopers 3: Winter Soldiers. Jay Chandrasekhar revealed that the film is in development at the moment and he was not kidding around. They're considering not even releasing it during the winter, according to Paul Soter, who calls the move "ballsy," even if the movie is "not in the winter." They might even film it during the summer time to go even further against the whole winter idea. The sequel to 2001's cult comedy Super Troopers was first brought up at San Diego Comic-Con over a decade ago, but it wasn't until 2015 that the ball actually started moving for Broken Lizard. The crew, inspired by the Veronica Mars crowdfunding idea, started their own Indiegogo campaign. They set a goal of a modest $2 million, which they were able to secure within the first 26 hours of their campaign. The group was shocked and when all was said and done, Super Troopers 2 raised nearly $5 million, meaning that they could make the film that they wanted and on their own terms. The team revealed at the Comic-Con panel that they were all super nervous about the box office for the sequel and that they all thought that it was doomed the night before it hit theaters. As it turns out, all of that worrying was for nothing. Though the sequel was not well-received by any means, it still made over $30 million in theaters, which means that Broken Lizard will have no problem getting Super Troopers 3: Winter Soldiers made when the time comes. Since the project is in its infancy, it will be interesting to see where the comedy group brings their version of the cinematic universe. Will they start to spoof the Marvel Cinematic Universe even further within the movie, possibly adding some comic book magic? It's too early to tell, but anything is possible at this point in time. There is no release date set for Super Troopers 3: Winter Soldiers, but expect some more news soon from the Broken Lizard crew. And while we have no idea what the third installment will be about, it's obvious that it's going to be over-the-top and vulgar, which is just the way that the fans like it. You can read more about Super Troopers 3: Winter Soldiers as well as the crew sweating about the box office of the sequel over at Vulture.